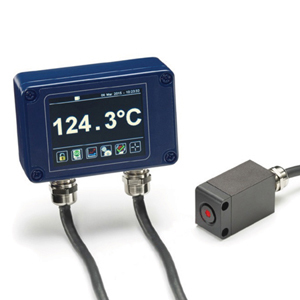 The OS-PC cube is an infrared pyrometer with an extremely fast response time and a very small measurement area size. It is available with or without the OS-PC-TSD touch screen interface. The sensor is designed for applications where an extremely fast response time is required, or where the object to be measured is very small. It is an ideal temperature sensor for blow molding preform measurement, as well as applications in the food industry, laboratories, and many others. Extrusion of plastic tubing and profiles requires temperature control to ensure consistent quality. The tube or profile can be narrow, so the very small measured spot of the OS-PC cube sensor is ideal. If the die is changed, the aiming angle of the sensor must often be adjusted, and the continuous LED sighting makes this easy. When testing the function of circuit boards, small components can heat up very quickly. The OS-PC cube sensor can monitor the temperature of very small components and read their surface temperature instantaneously. Food The OS-PC cube sensors advanced peak hold functionality is ideal for fast-moving conveyors, especially in food production. With the OS-PC cube sensor, it is now possible to measure the temperature of thousands of individual items every minute. Nota: *All units include as standard 0 to 20 mA, 4 to 20 mA and mV/°C outputs.